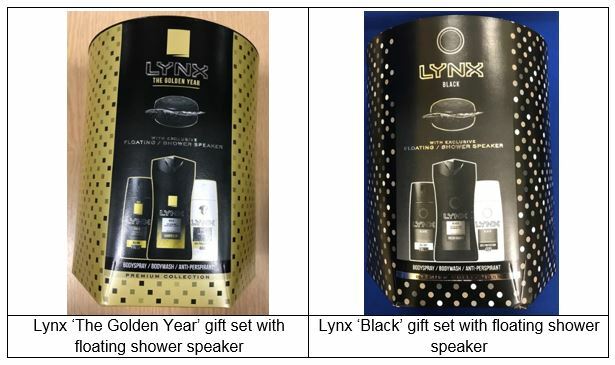 Unilever UK Ltd is carrying out a voluntary recall of two offerings; its ‘Lynx The Golden Year’ and ‘Lynx Black’ gift sets with floating shower speakers. The safety concern identified is that the USB cable may overheat during charging, leading to the potential risk of burns and/or fire. This recall only relates to the speaker and not to the cosmetic products within the gift sets. This product was stocked in the Republic of Ireland, through the following retailers: Argos, Tesco, Sam McCauley Chemists Group, Dunnes Stores, SuperValu, Centra, O’Sullivans Pharmacies, and C.H. Chemists, amongst others. If you have the above-listed product then please discontinue use of the speaker and charger immediately. Please return the item to the place of purchase with your receipt, where a full refund will be provided. If you have any further queries then please contact Unilever consumer care line on Freephone 1800 946 272.